Jonah – When God speaks, He eventually gets His way. Jonah was commissioned by God to go to Nineveh to preach and teach there, and to bring the people of that city to the Lord. We might tend to think Jonah should be able to go wherever he wanted to go, but that is not a principle taught in the Bible. Jonah decided to go in a direction completely opposite the direction the Lord wanted him to go. Jonah did not want to go to Nineveh because he knew the people in that city were very cruel. Jonah feared that if they didn’t accept the message God had for them they might persecute or even kill him. We can understand why he wouldn’t want to go there! We read that Jonah went out from the presence of the Lord. He turned his back on the Lord and went his own way! Jonah took passage on a ship to go where he wanted to go. Eventually they found themselves in the middle of a ferocious storm and the people on the boat learned that Jonah wasn’t doing what his God told him to do. Jonah knew this storm was a direct result his disobedience to the Lord, so he directed them to throw him overboard. He saw that as the only chance of saving the ship and crew. What happened next seems rather strange to some people but it says God prepared a fish. Some say it was a whale but the Bible doesn’t really say that. It was a big fish. This big fish swallowed Jonah, and he was in the belly of this fish for three days. That is a brief summary of Jonah chapter one. In chapter 2, we find Jonah in the belly of this big fish. He begins to pray and cry out to God? Why? He is in a big predicament and he doesn’t know if it will be life or death for him. Jonah eventually prays and God delivers him. This fish spits him out on the shore. In Jonah 3 it says that God spoke again to Jonah. 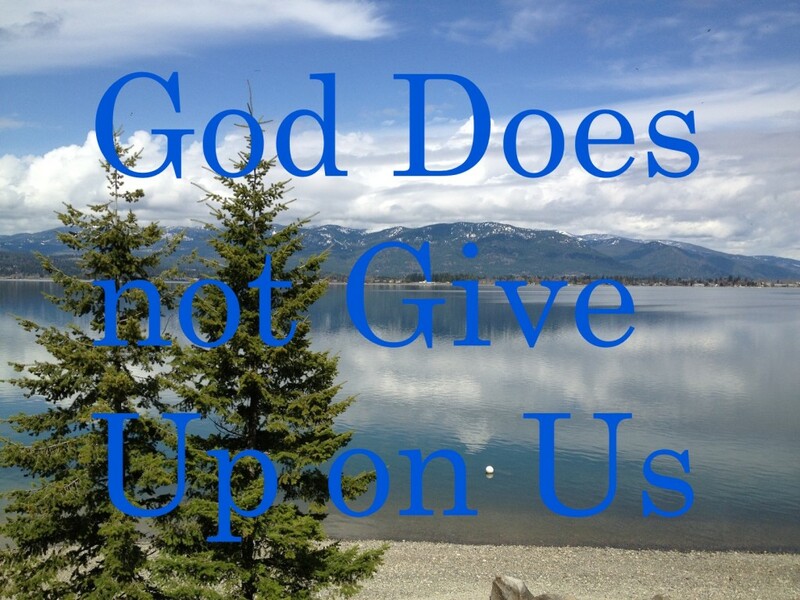 In other words, God didn’t give-up on Jonah. He still wanted Jonah to fulfill the original intention, purpose or burden that God had for him. God again asked Jonah to go to Nineveh, the city He had originally commissioned him to go to. Eventually Jonah obeys, goes to that city and preaches, and as a result those people turned away from their unrighteousness and to God. What is the simple principle we can learn from the story of Jonah? When God speaks, eventually God gets His way. If we don’t follow or go along with the Lord, He will sometimes allow something to happen that will bring God to our attention. In Jonah’s case, he spent three days in the belly of a big fish. There are two other examples in the Bible of people who went their own way and did their own thing and eventually got into trouble. Don’t forget, eventually God gets His way. The video this text is taken from is being uploaded to Drew’s YouTube channel. This entry was posted in Encouragement, Faith, Jonah, Obedience to Christ and tagged God gets his way, God has his way, God speaks, Jonah, Obedience, Obedience to God on July 31, 2012 by Drew Haninger.